Gabriel was featured in Cultured Magazine and in World Red Eye for the Miami “Skybridge” multi-city living and lifestyle event series. Originally from Brooklyn, Gabriel recently returned to New York after growing up in Virginia. He works directly alongside his cousin and team leader mTkalla Keaton, who has over 20 years of experience in residential brokerage and property management. Gabriel loves being able to work with his family every day, and his clients value the trust and loyalty that comes from working with such a close-knit team. He currently resides in a brownstone in Park Slope. 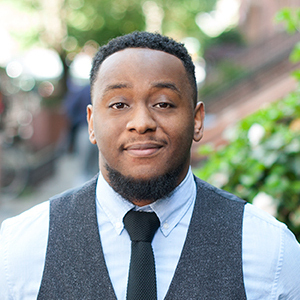 Gabriel specializes in residential sales and rentals throughout Brooklyn with a strong focus on townhouses and brownstones in Bedford Stuyvesant and Bushwick. Gabriel works closely with a wide range of buyers and renters to find apartments that fit their individual needs. He is passionate about real estate and cherishes the opportunity to work with people on a daily basis. Gabriel has always been characterized by his excellent customer service. He listens to his clients and makes them feel comfortable while identifying what they want and need in a home or apartment. He loves all genres of music and is a huge Brooklyn Nets fan. He loves spending time with his two-year-old goddaughter and someday hopes to travel the world.